As summer rounds the corner of May, the temperature is starting to shoot up the thermometer. I for one, am a big fan of Oregon summers: cerulean blue sky, puffy cumulus clouds, the brilliant green flora, and of course the perfect hot-but-not-too-hot weather. Naturally, the increased heat outdoors calls for some wardrobe adaptations, namely shorts. I personally love wearing shorts because long pants always feel stuffy and uncomfortable to me, but in the past few years they’ve been a little bit harder for me to wear. Wearing shorts brings up the strange contraption on my leg. I’d like this post to be a simple FYI explanation about the electronic cuff that I wear below my left knee. I’m choosing to write this not because I’m tired of answering questions regarding it, but because I truly believe that people would just like to know. About 2 years ago, I had my first round of radiation treatment. Not long after I was finished, I began to notice my left leg became quite a bit weaker and it would constantly drag when I walked. The nerves in my leg weren’t responding to lift up my foot as I moved. Pretty soon, I could barely walk, and when I could, tripping was a definite hazard. When we discussed the issue with doctors, they assured me that the weakness was a temporary side effect from the radiation. However, my family waited and waited for months for the symptom to get better, but it never really seemed to. Although this fact was pretty difficult and sucky, it had to be accepted for the moment so we could start tackling my new foot drop. Temporary solutions like an AFO (shoe insert that keeps your foot at a 90 degree angle) were found, but weren’t long lasting problem solvers. Then one day I came to the Hangers clinic, a business that sells orthotic adaptive devices. While we sat in the waiting room, my mom plucked up a brochure that had caught her eye. The brochure was for a device called a Walk Aide. The Walk Aide is a small battery box on a band that goes under my knee, and it has probes on the inside that stimulate the nerves in my foot to pick up via electricity. We asked one of the employees if we could try it out, and she agreed. Once I started wearing it, I knew it was a perfect fit. 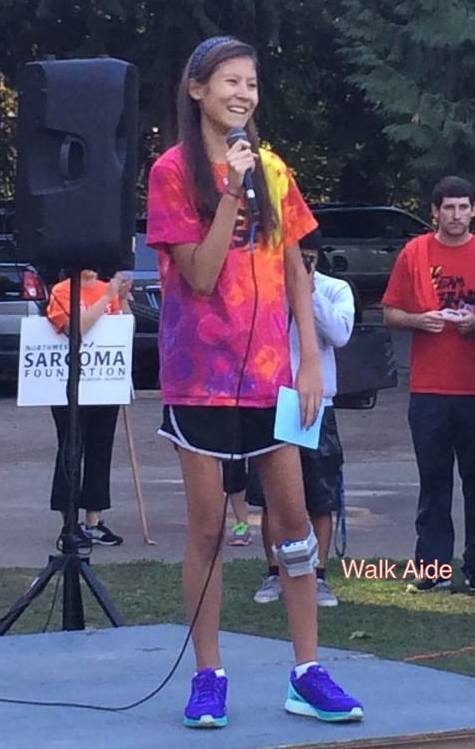 The Walk Aide was a miracle that made the difference between having to be confined to a wheelchair and being able to get around on my own. Even though I still wish things could have been different, I could not be more grateful to have this amazing piece of technology available to me. Honestly, I’d rather keep on living life focused on my accomplishments and the things that I can do,than dwelling on the discouragements that can bring me down. On bad days, I remember that I’m thankful enough to simply WALK, a luxury I know many people don’t have.